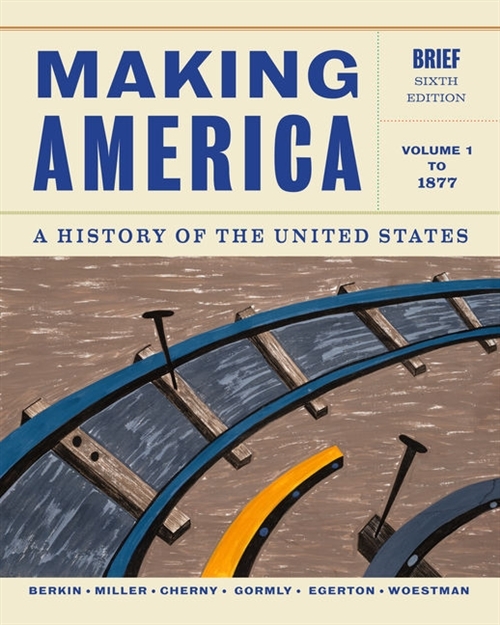 MAKING AMERICA: A HISTORY OF THE UNITED STATES, BRIEF SIXTH EDITION, presents history as a dynamic process shaped by human expectations, difficult choices, and often the surprising consequences. With this focus on history as a process, MAKING AMERICA encourages readers to think historically and to develop into citizens who value the past. The clear chronology, straightforward narrative, and strong thematic structure emphasize communication over intimidation and appeal to readers of varied learning levels. The Brief Sixth Edition retains a hallmark feature of the MAKING AMERICA program: pedagogical tools that allow readers to master complex material and enable them to develop analytical skills. Every chapter has chapter outlines, chronologies, focus questions, and on-page glossaries (defining both key terms and general vocabulary) to provide guidance throughout the text; the open, inviting design allows readers to access and use pedagogy to improve learning. A wealth of images throughout provides a visual connection to the past, with captions that help readers analyze the subject of the painting, photograph, or artifact from an historical point of view. 'Investigating America' gets to the heart of learning history: reading and analyzing primary sources. A new feature, 'In The Wider World' introduces a global perspective for each chapter. In addition, a new map program provides clear, visually engaging maps with globe insets to put the map in a global context. Available in the following split options: MAKING AMERICA, Brief Sixth Edition Complete, Volume 1: To 1877, and Volume 2: Since 1865.